This graphing calculator activity is a way to introduce the idea if the slope of the tangent line as the limit of the slope of a secant line. 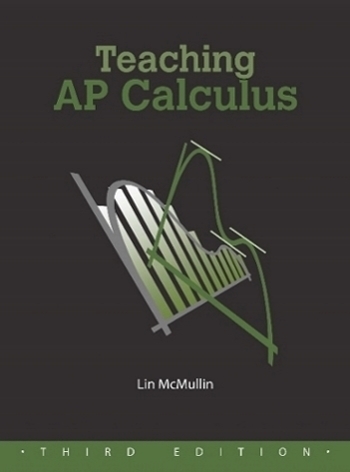 In it, students will write the equation of a secant line through two very close points. They will then compare their results several ways. 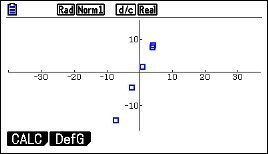 Begin by having the students graph a very simple curve such as y = x2 in the standard window of their calculator. Then TRACE to a point. Students will go to different points, some to the left and some to the right of the origin. ZOOM IN several times on this point until their graph appear linear (discuss local linearity here). To be sure they are on the graph push TRACE again. The coordinates of their point will be at the bottom of the screen; call this point (a, b). Return to the home screen and store the values to A and B (click here for instructions on storing and recalling numbers). Return to the graph and push TRACE again to be sure the cursor is on the graph. Move the TRACE cursor one or two pixels away from the first point in either direction. This new point is (c, d). 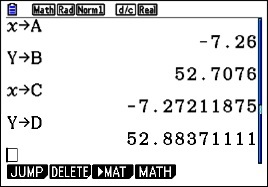 Return to the home screen and store the coordinates to C and D.
Enter the equation of the line through the two points on the equation entry screen in terms of A, B, C, and D. Zoom Out several times until you have returned to the original window..
Exploration 2: Ask student to compute the slope of the line through their points, again using A, B, C, and D. Collect each student’s x-coordinate, A, and their slope and enter them in list is your calculator so that they can be projected. Finally, plot the points on the calculator using a square window. Do the points seem to lie on the line y =2x? Try the same activity with other functions such as y = (1/3)x3, y = x3, or y = x4. Anything more difficult will still result in a tangent line, but the numerical relationship between x and the slope will probably be too difficult to see. You may also consider y = sin(x) or y = cos(x). Again the numerical work in Exploration 2, will be too difficult to see, but on graphing the points the result may be obvious. For y = sin(x) return to the list and add a column with the cosines of the x-values. Compare these with the slopes.